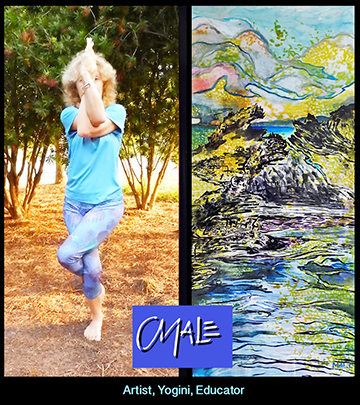 I began my journey with Art and Yoga in 1970, self taught from life and from practice through drawing and hatha yoga. I studied textile design at Fashion Institute in New York City and began exploring many types of yoga through a variety of classes that lasted until 2000 when I discovered Kundalini Yoga. My BA was received from West Virginia University in Interior Design. An MA was received in 1982 from Vermont College at Norwich University resulting in a one hundred and fifty page thesis, “Art as a Means of Raising Consciousness”. In 2000, I received an MFA from Savannah College of Art and Design resulting in an exhibition and paper regarding ‘Fractal Geometry and Chaos Theory as related to Conscious Ground’. Other lectures include “Repetitive Pattern Throughout History Used to Portray Conscious Ground”. I received Kundalini yoga certification in 2013 and have taken Level II, Conscious Communication. I have taught art from levels kindergarten through college and yoga in many gyms, dojos, and studios. I have taught yoga and meditation with the United States Marines. Currently I teach in the Savannah, Hilton Head, Bluffton, Beaufort areas from my Okatie studio located at 204 Student Union Street. I offer private classes, or classes for two, in Art and Yoga combined, or not combined, for the purpose of opening the body and mind and spirit to higher energetic vibrations. These classes result in experiential awareness. I offer a residency for a minimum of two weeks and a maximum of four months. Living space and studio space is available.